Clothing stains are a fact of life, but with proper treatment, few stains have to be a permanent part of your wardrobe. The faster you treat a stain, the more easily you can remove it, but even older stains can be lifted with the right tools and techniques. If you only remember one thing from this article, let it be this: Never run a garment through the dryer until the stain has been removed. We recommend you have the following items on hand to fight stains: Shout Wipes, Tide to Go, white vinegar, white toothpaste, Colorx 2 Laundry Stain Remover, and Dawn dish soap. Despite being a relatively well-coordinated adult human being who is generally good about proper napkin use and is as handy as anyone with common dining utensils, I have a preternatural ability to end up with a food stains on my thighs. I also, inexplicably, almost always get a spot or two of oil right in the center of my shirt when I'm cooking on the stovetop, something I do many times each week. Also, my wife and I have a preschooler and a baby, so my own issues aside, we deal with a lot of stains in this household. While an annoyance, to be sure, I've come to learn that clothing stains mean the need for a bit of tactical cleaning, not the need to relegate those pants to the yard work apparel category or that shirt to nights in only status. Almost every clothing stain can be removed, whether caused by wine, pasta sauce, grass, coffee, mustard, and more. By the way, carrying around a stain spot treatment product, like Shout Wipes or a Tide to Go stain pen is probably your single best weapon in the fight against stains. If you want to breathe new, clean life into a stained garment, there are three pieces of protocol by which you have to abide. Move fast: The longer a stain sits, the more it sets. Old stains can be removed, but it sure makes the process harder. The second after a stain occurs, you should be working to mitigate it. Don't scrub: Rubbing at a stain just works it deeper into the fabric, making its removal more difficult and potentially impossible. Moisten and dab, and then get onto using the supplies techniques covered below. 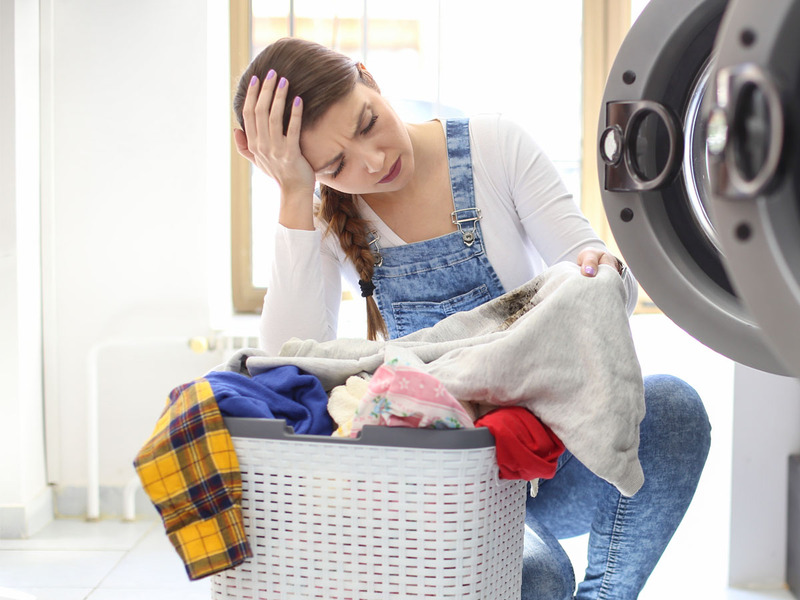 Beware the dryer: Don't ever ... ever put a stained garment through the dryer. The heat all but ensures permanence. If you have already spot cleaned and/or laundered the sock, turtleneck, sweater vest, or other piece of clothing yet you still see the stain, it's time for another round of cleaning! Line dry or lay flat to dry until you're sure the stain cleaning worked. You can also check out our guides to the best laundry detergents and stain removers for more great cleaning product recommendations. Minor grass strains will probably just wash out, but should you want to be sure you save those pants (or shirt, if things got more dramatic outside today), there are two great ways to do so. First, you can use vinegar. Just make sure to use white vinegar — balsamic will make things so much worse. Soak the stained portion of the garment (usually the knee) in undiluted vinegar for at least a half hour. Launder as usual, but, of course, don't use the dryer! If stains persist, let the garment to air dry, then try again with vinegar, or use our next approach. Clean grass stains with toothpaste. Just make sure it's a white paste. Soak a toothbrush in clean water, and then gently scrub at the stains. Yes, this does contradict the earlier admonition not to scrub. It's the only time I'll do so, but the fact is, that stain is already worked deep into the cloth. Believe it or not, the treatment for most beverages stains is the same, whether you're dealing with coffee, cola, or the dreaded red wine. Read our guides to the best laundry detergents and stain removers here. Soak the stained portion of the garment in white vinegar for 15 minutes. If you don't have vinegar, use club soda. If you don't have that, use water, just make sure it's cold. Launder the garment, and do so on its own if the stain was large. If the stain persists, you will need to wash the piece again with color safe bleach. Sauces come in a wide variety, from BBQ sauce to ketchup to pasta sauce to mustard. These stains can be complicated to clean up because a sauce is made from a variety of ingredients, each of which might on its own merit a different cleaning approach. But when you go step by step, you'll do just fine. Scrape away as much sauce as you can with a clean spoon or butter knife, and don't dab at the rest, as it will only spread and/or be worked into the fabric. Run cool water over the affected area for a minute or soak the stain in cool water for ten minutes. Treat stain with a spot treatment product or apply liquid laundry detergent and let sit for 15 minutes. Launder as usual, and you know the deal about the dryer by now. For the record, I mean like olive oil, not crankcase oil. You get that stuff on your chinos, and buddy ... you're going shopping. Oil stains are pernicious and require a unique pretreatment wherein you remove as much of the stuff as possible. Gently dab at the stain on both sides of the garment, lifting as much oil as you can. Apply a generous dose of salt to the oil stain and let it sit for a quarter of an hour; the salt will draw out even more oil. Apply a thin layer of liquid dish soap like Dawn, not detergent, and let sit for a few minutes. And just like that, you're in the clear. Or the clean, rather.